Packed with practical and reliable features, the 991B round bale wrapper range is designed with the efficient operator in mind. Round bale wrapper users should look towards the hydraulically operated cut and tie system, the efficient round bale wrapper dispenser, which maximises film usage and the 991B round bale wrappers patented ground supported damper system. 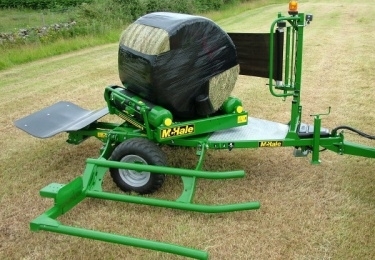 Like all McHale round bale wrapper's, the high output 991BJS bale wrapper will deliver a tightly wrapped silage bale that contains all the natural juices, which ensures increased nutritional value, while improving environmental protection.